Aya Omasa has joined the world of Instagram. The actress opened her account on February 4th, which was also her 25th birthday. Omasa's first Instagram post had a caption that reads, "I started Instagram. Please take care of me!". 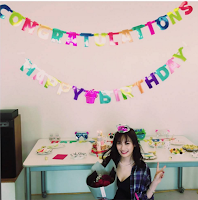 After receiving several birthday messages, she commented, "Thank you for the comments. I read them all~~ I'm 25 now!". "Today, February 4, was our Omasa Aya-chan's birthday! And, the moment we've all been waiting for! She's finally started her Instagram! Yay!"